The flyer below uses best practices with the Recruitment Center template. Each number on the flyer image corresponds with an explanation of why strategies (e.g., text, photos and graphics) were used and what makes them effective. Want our best practices checklist? Look at example below. 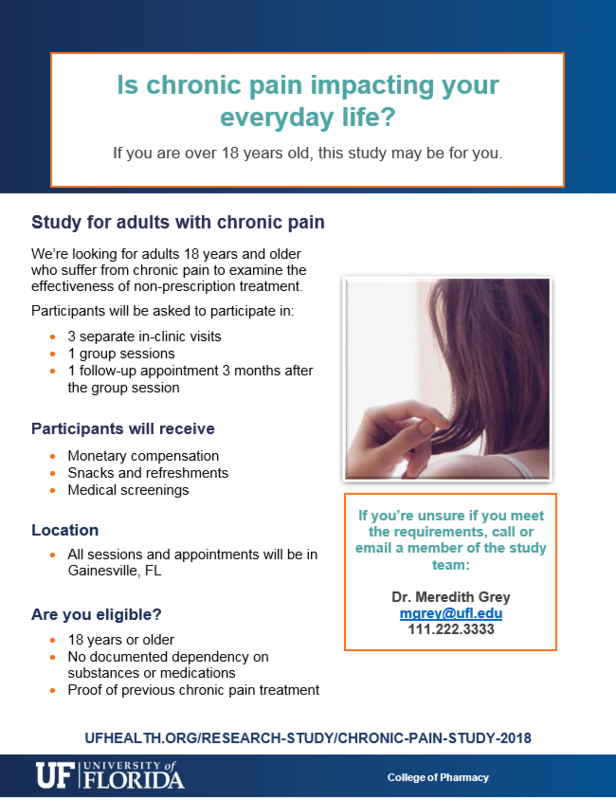 This headline speaks to the target audience (chronic pain sufferers), and includes eligibility criteria. See more headline guidelines here. Your audience can find more information on a study web page. You can create a listing on high-traffic UFHealth.org at no cost. Summarize the study name. Think about how you describe your study on your informed consent. Write study details in an easy-to-understand way, as if you were talking to your neighbor. Clearly state what participants can expect. Use bulleted lists where possible, as dense blocks of text can be difficult to read. Many participants are motivated by compensation. While this text must appear in the same size as the rest of the flyer, you can separate it out for readability. Include the address and, if possible, a brief description. If the study is on campus, include information about parking or public transportation. 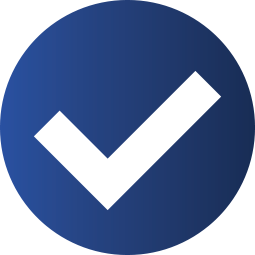 Save time for your team and participants by clearly describing requirements and letting participants know it’s OK to contact the team with questions. Be sure contact information is accurate and offer multiple channels (e.g. email address, phone number, website). Try creating a team email address, for example, diabetes-study@ufl.edu, in case of turnover. Contact helpdesk@ufl.edu for assistance in creating a team email address. Your logo usage will depend on funding. User testing on these templates demonstrated that tear-offs on flyers are preferred. Include crucial information in the tabs, such as email, phone, or a URL to the study website. Catch the attention of your target audience. If your flyer is hanging on a wall among dozens of others, what would make it stand out? Include these mandatory details in as succinct a fashion as possible (see example templates). 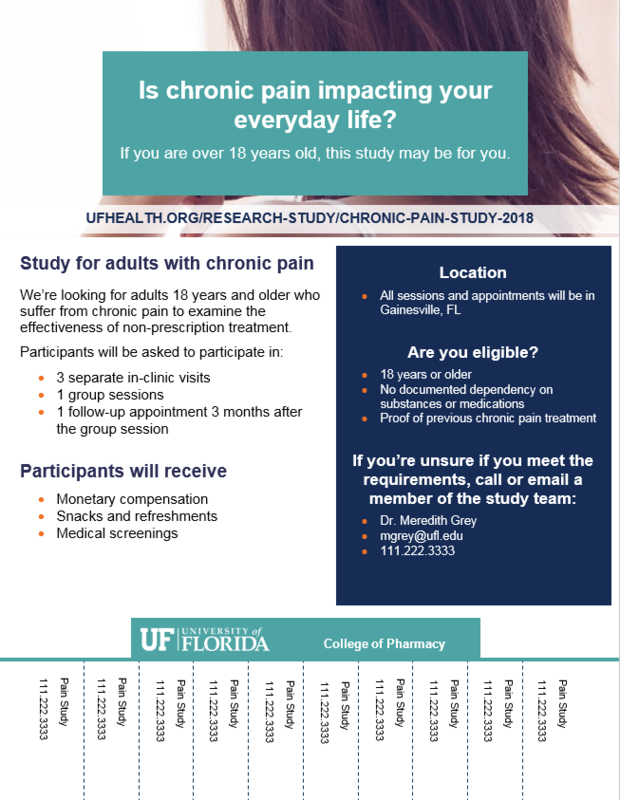 By including these details, you ensure individuals are contacting you because (1) they qualify for the study and (2) they have enough information to make an informed decision about deciding to participate. This saves time for both the researcher and potential participant. Keep it simple and concise. Many people find it difficult to retain a lot of written information. Did you know that participants are interested in research studies that are beneficial to their communities? Think about how your study will benefit the people you are trying to recruit and include that information on your recruitment materials. Unsure of the benefits? Consider including members of the community or your target population in study planning and development of recruitment materials. Medline Plus offers guidelines and resources to help you create easy-to-read health materials. University of Michigan Plain Language Dictionary: Enter medical terms and view alternative phrasing to simplify the description. High-quality (i.e., large file size that will display well, not pixelated, in print). Image should be at least 600 x 600 pixels. Format matters, especially to readability: The text boxes within the templates are sized for maximum effectiveness. Keep it simple and concise! Having trouble fitting all of your information on the flyer? Try condensing the content. 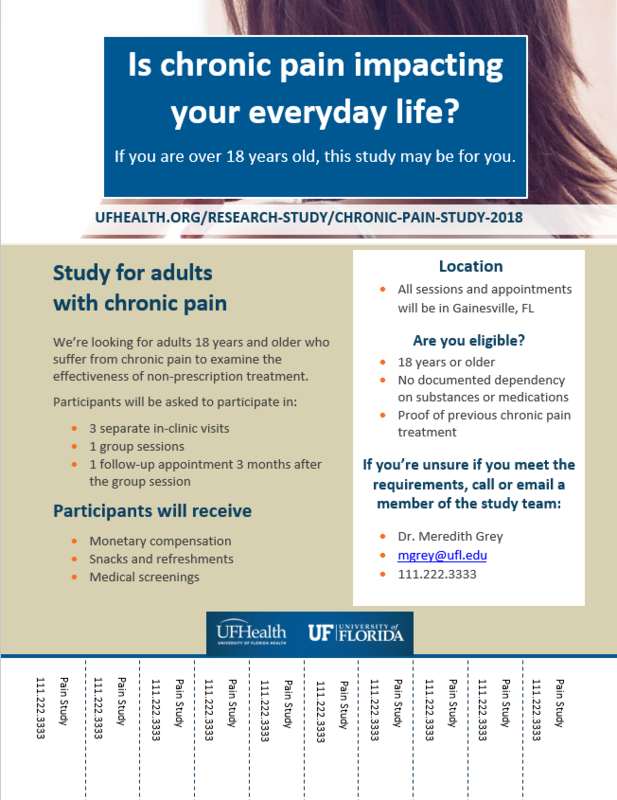 Use if you are funded by UF Health or are using UF Health services for your research. 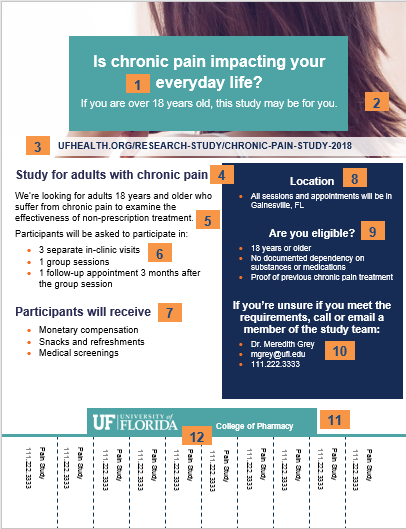 You will need to use the UF Health specific templates. You will need to use the UF specific templates. To view these flyers in detail, click on the image to enlarge. Ready to make your flyer? Click here to review and download templates.